In the first decade of Avatar, there were five Wizard courses held in Orlando Florida. These were profound experiences that not only changed the lives of the individuals that attended, but also seemed somehow to magically influence circumstances and events that unfolded in arenas of the world still untouched by the Avatar network. 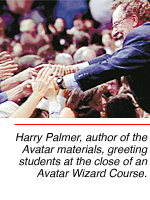 Among the highlights of the Wizard experience were talks delivered by Harry Palmer, the author of The Avatar Materials. The following is excerpted from a graduation talk given on January 27, 1995. Living deliberately requires courage and wisdom. These equate to power. Courage is the ability to perceive what is. Wisdom is the ability to foresee the consequences of an action. Combine them and you have power. Power is the ability to remain present and aware, and to shape reality. All beings have some allotment of power, but they probably do not have the understanding or control over it that you have as a Wizard. In their misunderstanding and confusion, they waste their power in pointless contests with each other. Their indoctrinated beliefs and their identities keep them in a competitive turmoil. Power that is used to aggrandize an identity or to possess something creates its own obstructions. Power that is used to acquire more power changes to fear. Wizards know how to handle power without creating repercussions. They are able to align their efforts into a synergetic influence capable of shaping that which is so fundamental that it is present even before the future reality is conceived. This is advanced wizardry. The first step is to create integrity in your life. To know such wholeness that nothing is favored. To be everyone and everything to the point that dishonesty or denial of responsibility is unthinkable. That's the first practice of a Wizard. By that practice alone you will remain present and know the power of being present. Re-acquire the ability to create and experience simultaneously. Simultaneously means that there is no time interposed between the creation and the experience–no minute, no day, no lifetime. You don't create effects that you are not willing to experience. You cease your unconscious creation of time. The less time between the creation and the experience, the closer you come to being alive. Time is created to compensate for your loss of power. When you have sufficient power, you won't need time. You will be present. The second step is to embrace simplicity. The Chinese symbol for this practice is an uncarved rock. It's uncarved because it doesn't have any definition yet. So this step has to do with shedding definition, letting go, not defining yourself, not investing in a viewpoint. The mind will quiet of its own accord. Again, do this and you will wind up in the present. The third step is to reduce the time you spend calculating for your perceived advantage. Release the mind from the slavery imposed by the ego. Allow yourself the gift of universal perspective. Wisdom will appear. Your actions will be guided by an intuitive, spontaneous, compassionately benevolent intent. There's no regret to pull you out of the present. There's no sense in trying to possess the result of your action, because in the moment of acting you have already fully experienced the result. And you are still present, like the proverbial lilies of the field. The fourth step is to see the emptiness of your desires. Direct without possessing. What can you have? This idea of possessing implies time and definition and takes you out of the present. The past no longer exists, nor does the person who lives for the past. When you possess something, you have to have it for a length of time; you have to create some time in which it stays around. Along with the possession comes the creation of some time, and this time is a bet you place against your own power. When you view yourself from the perspective of living in the world, but still being a facet of that absolute power that generates time and the realities time enfolds, you will discover the power to shape the world. Wizardry! The ancient Chinese called it steering the Tao; we call it the Wizard's art. The intention of this absolute is to know itself, to explore its own possibilities, in a rhythm that always returns to balance. That is the intention; that is the Tao. In the West we call it nature. Think of nature and contemplate the action of a mountain. It is thrust up and then it wears away, returning to balance. How long it takes is irrelevant when there is no shortage of time. Think about the mountains and valleys coming into balance because they appreciate and share each other's existence. That is an idea of what an enlightened planetary civilization feels like. The Tao runs it course. So be it. Some beings accept this fact in sweet surrender. Think about the mountains and valleys coming into balance because they appreciate and share each other's existence. That is an idea of what an enlightened planetary civilization feels like. Wizardry, which is the foundation of all human knowledge, understands that one can accelerate the Tao. A Wizard observes nature and accelerates it. That is the Wizard's art. It's the fundamental of every technology. An enlightened planetary civilization will happen. If not on Earth, on some other planet. It's the return to balance. Your work is to accelerate it so that it does manifest on Earth. That is the goal of Avatar. Think of the collective consciousness on this planet as agitated water, muddied water, with lots of waves, currents and eddies stirred by the conflict of desires and resistances. Everytime an Avatar is awakened, there is a stillness in the muddied consciousness. It begins to settle out. 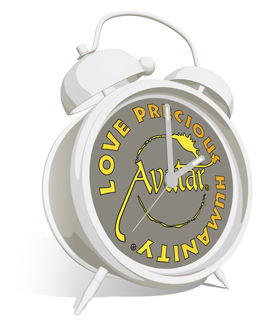 Awaken enough Avatars and a clarity will result. In that clarity, every being will perceive the direction of humanity's evolution and a massive acceleration will ensue. It is not a question of will it occur or won't it occur. The Tao will run it's course whether the work is done or not. The question revolves around this, to what degree is your power insufficient to create an enlightened planetary civilization right now. Your answer tells you how much time you need to create until the experience manifests. That's really the only concern that an Avatar has with this creation. How much time is needed? Every day the amount of time you need to reach your goal diminishes.